My wife and I finally got the chance to see the first part of The Hobbit trilogy the other day (with two young kids, our opportunities become more rare, so having Anne’s parents in town really helped in this regard). I was wary at first. I had read a number of negative reviews and, being a lover of Tolkien’s work and the previous Lord of the Rings films, I was afraid to see the film version not live up to expectations. Lowered expectations always help when going into a film (part of why I read the critics first), and this proved to be the case here. But, even if I had higher expectations, I still believe I would have been just as moved by the film. Sure, the film was a little more humorous/campy and less “epic” than Peter Jackson’s previous cinematic treatment of Middle Earth (the original film trilogy will always be beloved to me) but I was expecting that. The Hobbit, as a book, is very different beast than the subsequent Lord of the Rings. 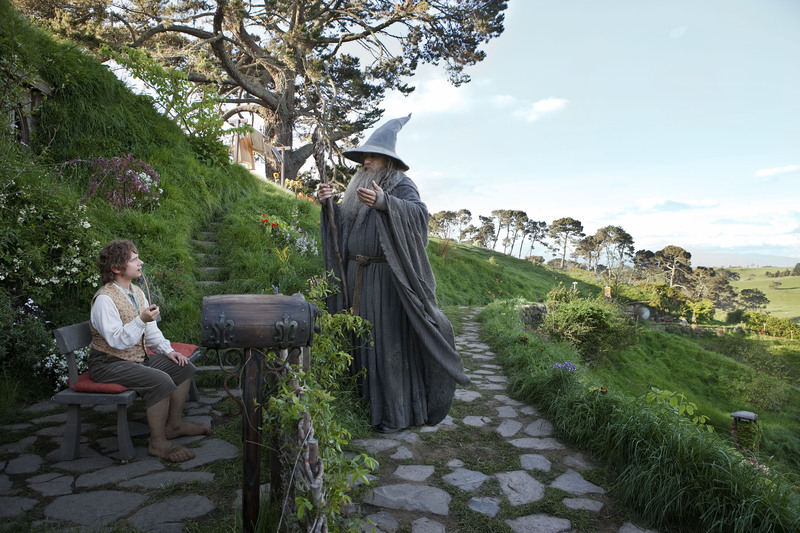 The Hobbit is a much lighter story written with a younger audience in mind, and, if anything, the film could have used some of the book’s restraint instead of trying to constantly re-create the successful formula of Lord of the Rings. However, despite my initial reservations in the filmmakers’ decision to create the single volume book into a trilogy (with help from Tolkien’s appendices of LOTR and other “history” he wrote about Middle Earth), I was very pleased with what expanding the story did for the characters and themes of the book. Bilbo, Gollum, Gandalf, Thorin, and other Middle Earthlings gain much and lose little in expanding the tale. Tolkien’s magical but simple tale becomes richer, more nuanced, and more meaningful with this expanded treatment. As heretical as that may sound to Tolkien purists, and as much as I love the original book, I thought the film had much more emotion and characterization than its source material. When I was in fifth or sixth grade, I was becoming interested in the thrillers for younger readers written by R.L. Stine. Not the Goosebumps series which became popular after I was older (just looking at the covers of those more recent installments make me shudder…not out of fear, but because of the sheer cheesiness), but his earlier books which were thrillers of a much more realistic nature (at least to my adolescent mind). I remember being in a bookstore, with my mother and some of my sisters, looking through those books and I could tell my mother wasn’t quite sure about buying her young son books about teenaged characters escaping murderers, so we were at a bit of an impasse. Seeing a possible argument brewing (my mother and I often conflicted about my interests–from action figures to comic books), my sister Sarah intervened and took my young self over to the fantasy section and introduced me to four books by J.R.R. Tolkien–The Hobbit and The Lord of the Rings. I remember being intrigued by the covers, as well as having wonderfully vivid (and somewhat haunting) memories of Rankin/Bass animated version of The Hobbit from watching it in elementary school. So with the endorsement of my sister Sarah (whose taste I trusted implicitly–and still do), my mother bought me the books. Although it probably ended up being a more expensive investment (four books instead of one), I think she felt much more at ease about the purchase. Looking back at that moment, it was probably a significant shift in my life. I had always been interested in the fantastic– the X-Men, He-Man, The Chronicles of Narnia, Greek myths, an interest in Big Foot/aliens, Thundercats, the books of Roald Dahl, A Wrinkle in Time, and Ninja Turtles had been major staples of my childhood. But at that moment, I more or less gave up those R.L. Stine thrillers (which I’m sure were much more mainstream, “realistic,” and modern at the time) and became once again immersed in the world of the fantastic. It was also around this time that I made other related shifts in my life. I more or less stopped playing basketball and abandoned my (unsuccessful) attempts to be good at sports. I had been playing Jr. Jazz basketball at the encouragement of my parents, especially my mother who always seemed disturbed that I wasn’t as interested in sports as she wanted me to be. Meanwhile my Father was more or less supportive of whatever I liked, but sports were definitely more aligned with his own personal interests. Jr. Jazz was fun, especially since my Dad was one of the volunteers who coached the team and I enjoyed spending time with him (and getting 32 ounce soft drinks with him and the boys after practice). Yet I was never as good as some of the other boys (despite my height). I was usually commended for my vigorous efforts in defense, but it was a very rare thing for me to actually make a shot. Also, looking back at the sharp pains and wheezing in my chest I’ve received since childhood whenever I exercise vigorously, I also think I may have exercise induced asthma (which I didn’t even know existed until recently). Thus around fifth and sixth grade I began making a shift that changed the direction of my life. I had discovered that I had an interest (and, as adults told me, a talent) for writing. I also got involved in my elementary school’s theatre program (I was less talented in this, but no less passionate). Bit by bit my mainstream interests (or forced interests) were giving way to what I had always really loved and never stopped loving–stories, magic, monsters, heroes, and adventure. That decision to chase after my bliss shaped the rest of my life and I have never, for one instant, regretted making that conscious choice as a child. The Hobbit and Lord of the Rings was a part of all that, for which I will always be grateful. So, fast forwarding to the end of 2012, and sitting in a movie theater with my wife, re-living Bilbo’s adventure in a new way, I found myself moved when Bilbo, after finding his home infested with uninvited dwarves and a mysterious wizard planning an adventure and, who have drawn up a contract expecting him to come with them, is drawn to the plans they are making. The rational, intellectual, safety loving part of Bilbo (the Baggins side of his heritage) is desiring to be rid of all of them and get back to quiet reading and gentle living. However, his adventurous desires (his Took side of his heritage), that have stirred him since he knew Gandalf the wizard and his fireworks as a child, have re-ignited after long suppression in his heart. In one of the movie’s many beautiful moments, Bilbo wakes up to find the dwarves and the wizard gone (they have even proved to be good guests and cleaned up after themselves!). His hobbit house in the ground is peaceful and quiet and all is as it should be…or as it should have been before the dwarves and the wizard. But that desire had been re-kindled and as much as he complained the night before, and as much as he insisted he wasn’t going on an adventure with them, Bilbo found himself wondering if he had just made one of the greatest mistakes of his life letting them leave on the adventure without him. In this moment Bilbo looks down the quiet hallway to his door, beckoning him to open it. When Bilbo says this in the film, the ecstatic joy on his face overwhelmed me, and that little adventure loving boy inside of me leapt at his decision, yelling out encouragement to Bilbo to follow his happiness and meet a journey that would change him and make him a better, more loving, more understanding, and wiser hobbit. And by the end of this first installment, we discover the great hobbit he had always been, but that just needed to be tried, and pushed, and tested, and then when Bilbo at the height of the film’s conflict, rushes into the face of danger to save a friend–knowing that it very may kill him to do so–tears leapt to my eyes. Those who try to compare The Hobbit to the epic journey that is found in the pages of Lord of the Rings, whether the books or the films, do not understand that The Hobbit is a much more intimate tale and bears a different kind of enjoyment and soul searching than its sequel. Despite the host of other interesting characters in the story, this is solidly Bilbo’s journey and the further depth that Martin Freeman’s performance, Peter Jackson’s direction, and an expert screenplay bring to Tolkien’s tale is a welcome addition. No, it doesn’t have the Lord of the Rings epic sweep and stakes. Yes, it’s at times much more silly and whimsical (even crass). Yes, it’s lacking a lot of female influence within its characters (although Galadriel is a memorable character in the film and I’m very glad she was added in). And, yes, it has a great deal of the excessive violence (which Lord of the Rings had as well). But, amidst all of that, I simply didn’t care about any of those complaints that I have read. 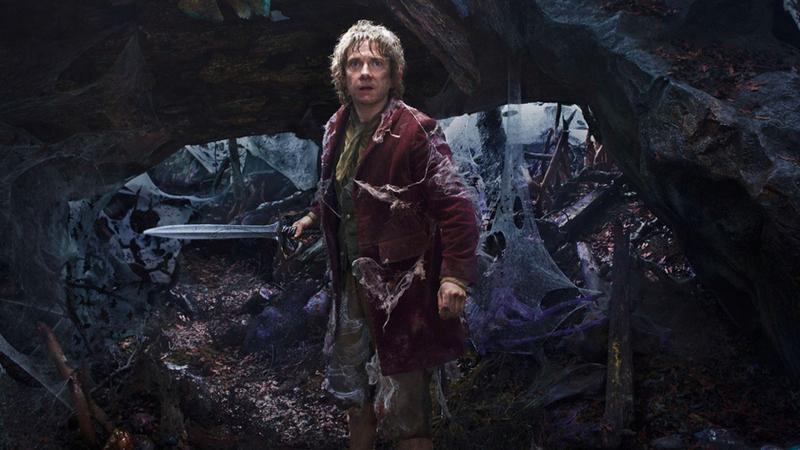 For, the film, really nailed (and even exceeded) Tokien’s original message personified in Bilbo Baggins–that a worthy adventure, despite its sacrifices of comfort and reputation, is good for the soul. That the longings that one felt in childhood when a wizard came and shot off some marvelous fireworks… those yearnings and longings shouldn’t be discarded just because one has become a supposedly rational adult. … and I also was a guilty adolescent consumer of the earlier Stine works. My mother caught me with one when I was 12 and then forbade them. I was a little relieved 🙂 For me, indulging in the frightening always has repercussions. But I needed her intervention…. the fear & tension made them too salient for me to tear myself away. I saw the Hobbit and enjoyed it much more than I did the first time I saw The Fellowship of the Ring. Of course, I had not exposure to Tolkien then so I was much better informed this time around. I was a little doubtful that they could make three epic-length movies out of so small a book, but then I started thinking about how the BBC frequently does that with their adaptations of British Classics. If you can make a 9 hour adaptation of Pride and Prejudice, you can make a 9 hour adaptation of the Hobbit. Scott, I also thought about the BBC when I saw the film. I REALLY enjoy British miniseries based on the novels of Dickens, Jane Austen, etc., so I took the film in that same spirit. I’ve found that I’m a big fan of long form storytelling in television and film, as long as there’s plenty of focus on character (instead of an overlong battle between a big monkey and dinosaur as in Jackson’s King King–oi. Now THAT was a good movie that just needed a lot of trimming). The Hobbit definitely had plenty of focus on character, so I was plenty enthralled. Sarah, the “ordinary heroism” you mention was one of the things that just made me love Bilbo. It’s one thing for a trained warrior to do battle for good, but it’s a whole other thing for an ordinary, untrained person to do so in the face of great danger. I can’t describe the feelings I was having when he leapt in to the save Thorin. Lovely post. I also loved the movie despite its departures from the book. The Hobbit is, indeed, a much different novel than those that follow. In my admittedly uneducated view, the book is still very much grounded in the English fairy story tradition with liberal doses of the Brothers Grimm. The elves, the trolls who turn to stone, the talking dragon, Mirkwood–Middle Earth has not yet become the entirely “other,” fully-realized world the reader encounters in The Lord of the Rings. I’m actually glad of that; as I see Tolkien’s progression as a writer, I have hope for my own. I also found Martin Freeman’s performance very moving. For that alone, I can forgive the far too early introduction of Gollum’s split personality and the fact that Richard Armitage’s gorgeousness threatens to overwhelm the character of Thorin Oakenshield entirely. Next Next post: What now, McBride?